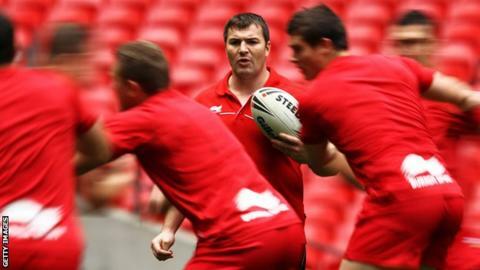 Iestyn Harris says he has taken Wales' rugby league side as far as he can after stepping down as head coach. Harris, the new head coach of Salford Red Devils, has resigned with immediate effect from a role he had held since 2009. The former dual-code international led Wales at the 2013 World Cup, where they lost all three group matches. "It was a decision I made a few months ago that I wouldn't be involved with Wales going forward," Harris said. "It was a tough decision and I thought long and hard about it but I feel I have taken Wales as far as I could." Oldham-born Harris, who played for Warrington, Leeds and Bradford Bulls, succeeded John Dixon as Wales coach after a spell as assistant. Under Harris, Wales won the European Cup twice and played in the 2011 Four Nations against Australia, England and New Zealand. However they had a disappointing World Cup last year, falling to progress beyond the group stages after losing to Italy, the United States and the Cook Islands. Harris says he had decided to relinquish the role with the national team before talking up a new job with Super League side Salford. "The role at Salford hasn't influenced anything to do with Wales," Harris told BBC Wales Sport. "I think when you are a day-to-day coach in a club environment and an international coach at the same time it does absorb a lot of time. "I've done role for the last four or five years and to have time with my family at the end of the year is important to me now. "I've had a fantastic period with Wales and it's been part of my development as a coach. I will be ever so grateful to Wales Rugby League for giving me that opportunity." The 37-year-old has left his role as Wigan assistant coach to replace Brian Noble at Salford, agreeing a contract until the end of the 2016 season. Harris, who also won 25 union caps for Wales, coached Crusaders for a season in Super League. "I always wanted to be a head coach and the organisation that I've been in the last two and a half years at Wigan has been excellent for me," Harris added. "The next five or six weeks is the crucial period to spend with the team and allowing them to understand how I work and what my expectations are. "That time together will be crucial for our long term development."